Santa Fe Workshop - Sold Out sort of. 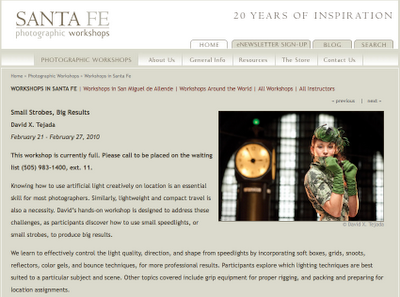 The Santa Fe Workshop I'm teaching on Feb 21, 2010 is sold out. I understand that their are at least 5 or 6 on a standby list and if we can get a few more interested folks, we will add an additional workshop. I have set aside the week of March 21st for this additional workshop should it happen. If your interested in a week long SSBR workshop in Santa Fe, please contact the workshop and get yourself on the list.